I’ve handed my beekeeping operation, still headquartered at my home, over to my sons Eric and Ian, with the provision that I have the hives at my disposal for research during my “retirement.” This season I was overly ambitious, running two field trials on oxalic acid, one on improving the formulation of pollen subs, and one on the drift of bees and mites associated with collapsing colonies. That in addition to the roughly 1400 mite washes involved in my selective breeding for varroa resistance, plus my formally testing of a bee health product for the manufacturer. I’ll be publishing the results of all but the last as I get them written up. I’ll start with an update on my progress with extended-release oxalic acid. Disclaimer: I’m collaborating with the USDA-ARS to register this application method for oxalic acid, and have a Pesticide Research Authorization from the State of California. The method described here is not yet registered in the U.S. But since my research is funded by donations from beekeepers, I feel that I owe a progress report to those donors. I in no way encourage the unregistered application of any pesticide — please wait until this method is approved by the EPA and your State before using it in your own hives. We beekeepers are in desperate need of a mid-to-late-summer varroa treatment that is effective when there is brood in the hive and there are honey supers on, and that can be used in hot weather. Ideally, it would also not contaminate the beeswax, nor require a face shield or gas mask for safe application. An extended-release formulation of oxalic acid may fit the bill. My previous updates on this research are at my website , in short, I found one experimental formulation of oxalic acid dissolved in glycerin (OA/gly) to be highly efficacious at reducing mite levels during the summer in my California test yards. But I needed to know whether other formulations might work even better. So I ran incubator trials last winter, testing a range of ratios of OA to glycerin, as well as different degrees of saturation of the cellulose matrix (using Scott® shop towel towels), an alternative solvent/dispersal agent (propylene glycol), and the effect of humidity. I attempted to duplicate bee and mite exposure in a colony by attaching a measured square of shop towel to a piece of beeswax-coated plastic foundation and adding a carefully-measured amount of different OA/gly formulations to the towel (Fig. 1). Figure 1. 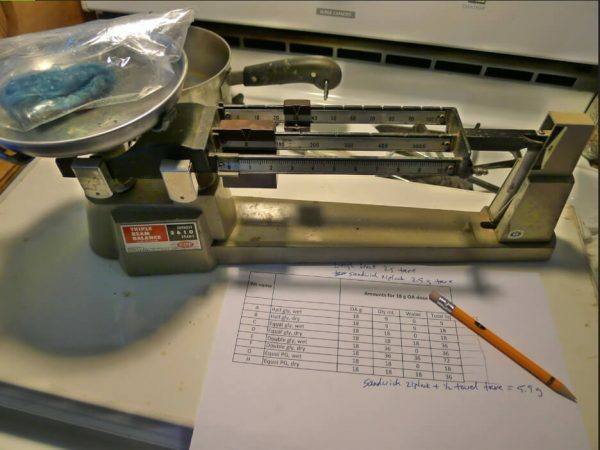 Adding a measured amount of a test formula to a 1-inch square of shop towel. I then added roughly 150 young adult honey bees (measured volumetrically) to each cup cage. The bees moved about on the piece of foundation, mostly clustering towards the top, and thus were exposed to the OA/gly similarly to how they would be in a hive (Fig. 2). Figure 2. I maintained the caged bees in a dark incubator at 32°C and roughly 60% RH. In some tests I used bees from high-mite colonies and added a screen to the bottom, so that I could calculate mite mortality due to the treatment. I ran eight incubator trials in all, performing nearly 200 chemical titrations to quantify the amount of OA residues on the bees’ bodies. I was frustrated that exposure to even a small piece of OA/gly towel often killed all the bees in the cage. In brief I found that it took very little OA to kill the mites, but that it took some amount of glycerin to expose the mites to the OA. On the flip side, too much glycerin on the towel caused excessive “wetting” of the bees, and jaw-dropping overexposure to OA, causing agitation and death (but not from glycerin alone). There was also some suggestion that this adverse effect was exacerbated by higher humidity. But I needed to end my cage trials when we put the incubator back into service for holding queen cells, and decided to run a springtime field trial in actual hives instead. I did run that trial and will write about it later (since I still need to perform hundreds of titrations of frozen bee samples). But before I could finish the springtime trial, which I hoped would narrow down the 8 formula options that I was considering, it came time to start the summer field trial. So I bit the bullet and tested them all. To compare the performances of various ratios of OA to glycerin, as well as different saturations of the shop towels, in order to determine whether we should pursue last season’s formulation, the Argentinian formulation , or other ratios or saturations. To test using propylene glycol instead of glycerin as the solvent/carrier for the OA. 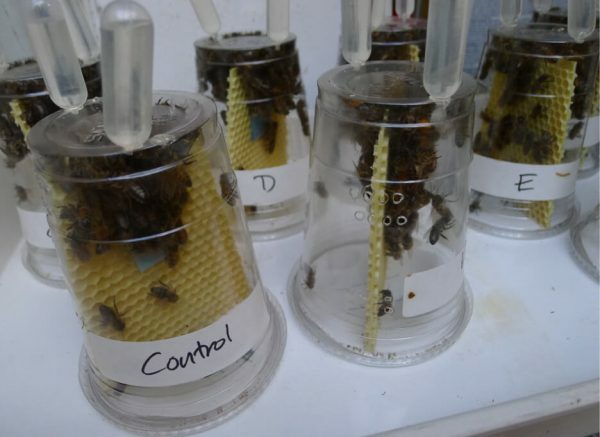 To attempt to replicate the efficacy results from last season’s two trials, under even more field-realistic conditions, in a number of yards, on a mixture of colony strengths, with additional hives present in the yards, and with exposure to some mite drift from collapsing colonies. To compare the extended OA treatment to repeated OA vaporizations. 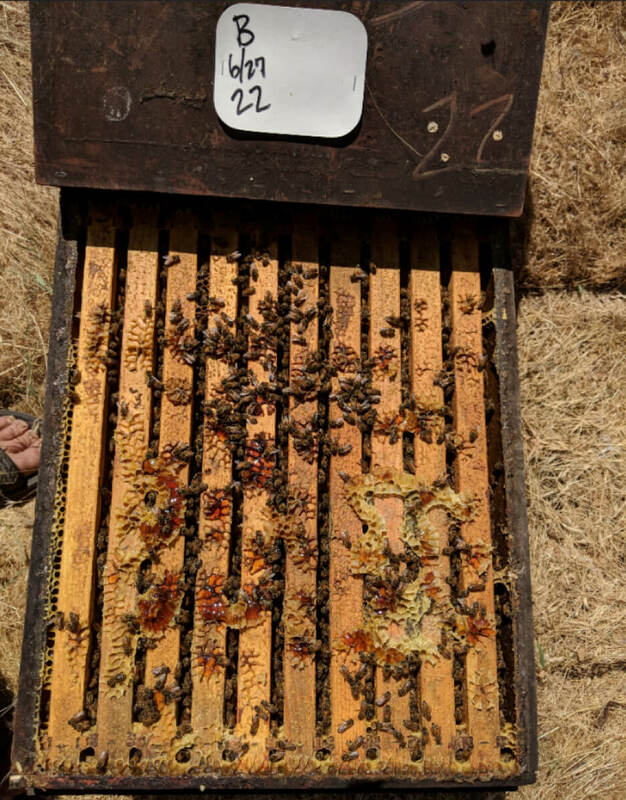 We ran the summer trial in 14 different yards, containing from 24-75 colonies in 2-3–story hives, headed by second-year queens. The colonies had been last treated for varroa the previous December with an oxalic dribble and then run to almonds. In order to allow the mites to build up, in early April, we split each second-year queen off into a nuc to prevent swarming, and allowed her colony (and the mite population) to grow to decent strength by the start of the trial. In order to get enough test hives, we needed to also include one yard of colonies started this season with fresh queen cells, which had last received an oxalic dribble in April. Our selection of the test and control hives is further described later. 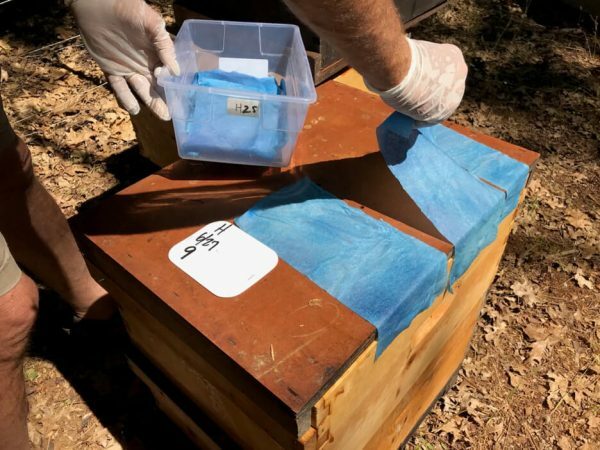 No hives had been treated with synthetic miticides previously, nor exposed to ag chemicals other than possible exposure to fungicides in almonds in March. By mid-June, colony condition varied considerably, as it would in a typical apiary, with some colonies being quite strong and productive, others weaker; but we did not include any colonies that appeared to be sick, queenless, or failing. 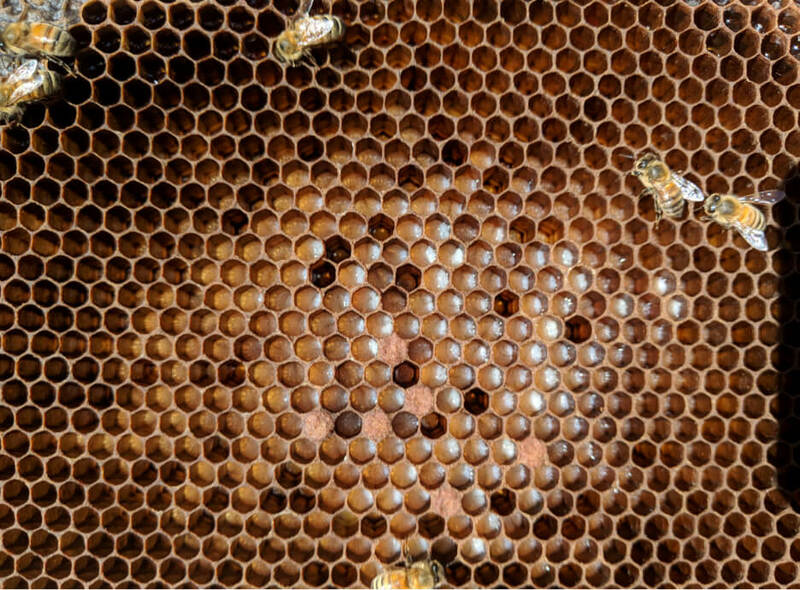 At the start of the trial, the colonies were full of brood, and our main honey flow was underway. We prepared 9 different formulations to test, as below (Table 1). Based upon last season’s results, all treatments applied 18 g of oxalic acid to the hive, other than treatment M, which tested whether a low OA, high glycerin application would be efficacious. Table 1. Treatments used. 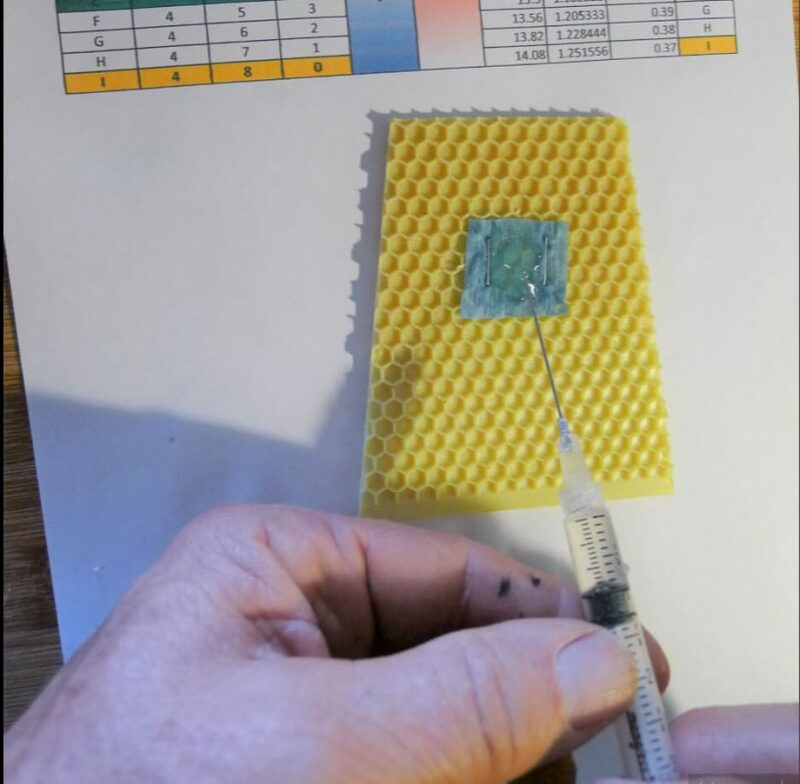 The ratios are w:v:v. All treatments were of 18 g OA per hive, other than M, which received 9 g. “Dry” indicates a towel partially-saturated with the carrier, rather than that water was added — see below for more explanation. Carrier abreviations: “Gly” = glycerin; “PG”=propylene glycol. *Treatment D was similar to the formula which I tested last season. Treatment E is the same as the Argentinian formula. 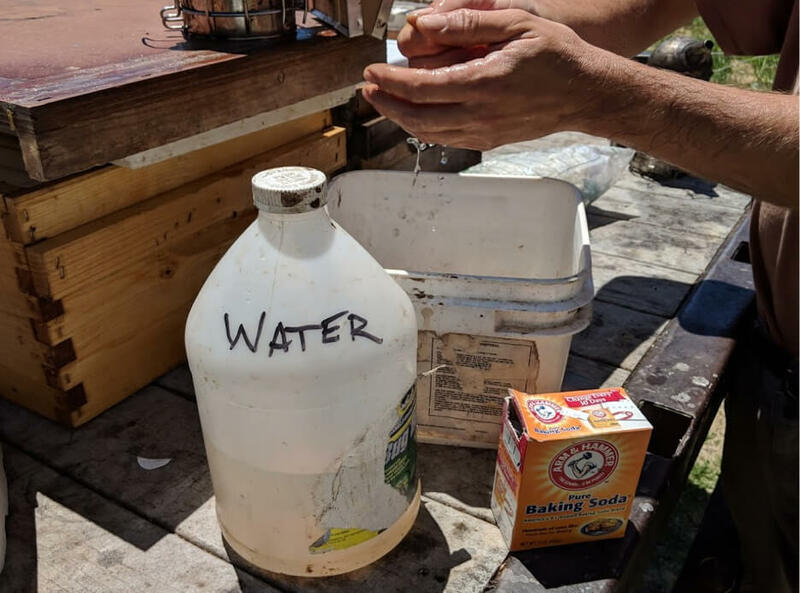 “Dry” in the table above indicates that an amount of water equal to the carrier (glycerin or propylene glycol) was added, and the solution was then soaked into twice as many towels, in order for the towels to be less saturated (feeling more “dry”) once the water evaporated off. I did this because my previous testing indicated that bees appear to avoid “wet” towels fully-saturated with glycerin. The test formulas thus covered a step-by-step range of ratios of OA to glycerin (or propylene glycol), as well as being either fully saturated (wet) or half saturated (dry) after the water in the formulation evaporated off (Fig. 3). Note how we needed to apply twice as many towels for the “dry” treatments. Figure 3. Prior to testing, we mixed a batch of each formulation, allowed it to absorb into a towel, and then held the towel until it ceased dripping. We then weighed the towel in order to determine how many towels would be required to hold 18 g of OA for each formulation. Note: when I post this article to my website, I will include more photos of preparation and field application. 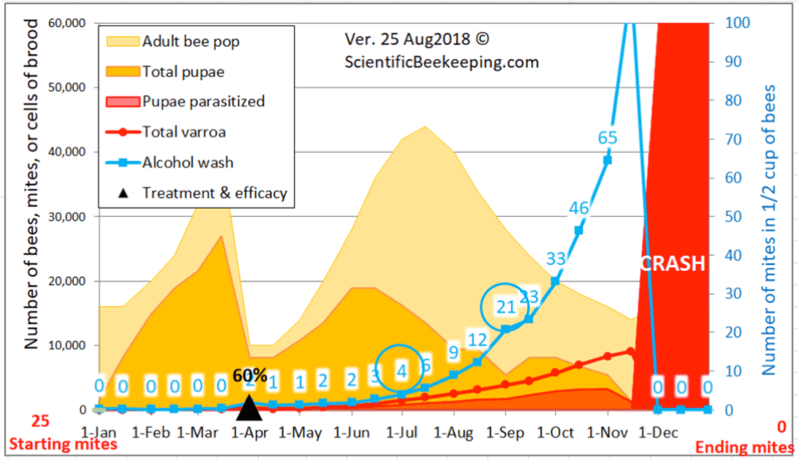 From 21 June through 3 July, we took baseline alcohol washes from every hive in each yard, and applied treatments yard by yard, selecting hives for treatment that had varroa counts in the range of 5–20 mites (all mite counts in this article are per level half cup of bees — typically 320-340 bees), although as we ran short on colonies, we included some with starting counts of up to 28 mites. In each yard we assigned treatments in alphabetical order, starting where we left off at the last yard, so that we arbitrarily applied each treatment to approximately 25 hives (other than Treatment M, which was an afterthought), evenly distributed between yards (Figs. 4-6). Figure 4. Each formulation required the application of a different number of towel halves or quarters, so we laid them out in advance on top of each test hive. We’ve learned that it’s best to designate one person to wear nitrile gloves and handle the towels; another to smoke the hives and open them. Figure 5. In each yard, we went down each row of hives, assigning treatments in alphabetical order. Here we’d laid out the towels and were ready for a double check on proper hive labeling and towel count prior to application. Most of the test hives were drawing foundation in the second box, some in a third. The towels were applied across the top bars of the lower brood chamber, with no queen excluder, since we’ve found that for good efficacy, that the towels are best applied in the middle of the cluster. Note in this photo that we excluded any hives with issues from the trial. Figure 6. If you get OA/gly on your skin, you won’t notice for a while. So after any chance of exposure, we rinse our hands, hive tools, and smoker with a solution of baking soda, which immediately neutralizes any acid residues. A tip: we dust our hands with baking soda before pulling on the nitrile gloves (this also makes it much easier to slide your fingers in), and are careful not to touch anything else so long as we have gloves on. During application of the towels, we noticed that some formulations were much easier to handle and apply than others (Table 2). This will be a consideration as we figure out the best way to apply this treatment. A: Half gly, wet Very easy to apply — OA mostly crystallized and rigid. B: Half gly, dry Easy to apply. C: Equal gly, wet Sloppy and difficult. D: Equal gly, dry Fairly easy to apply. E: Double gly, wet Towels very sloppy and transparent, messy. F: Double gly, dry Sloppy and difficult. H: Equal PG, dry Fairly easy to apply. M: 4x gly, half dose OA Sloppy. *I can’t explain it, but this formulation appeared to undergo a chemical reaction when placed upon a hive cover in the sun, and became noticeably hot to the touch. Any colonies in the yards that tested at a mite count of over 20 (or 28 in the last yards) were passed over, but given a strong formic acid treatment to reduce their mite counts to nearly zero, in order to avoid excessive drift of mites in the yards. We left untreated 19 colonies with starting mite counts from zero to 13, to serve as Controls (and as potential mite-resistant breeders), again distributed through several of the yards. We did not use Control colonies with high mite counts, since they might later collapse and corrupt the trial due to mite drift. Note that the Control hives, due to their low starting counts, might have been the most mite resistant, which, if anything, would later underestimate the efficacy of the treatments. After approximately 50 days, we took ending mite counts, again progressing through the yards in the same order. A few colonies had dwindled, and some were in the process of varroa/DWV collapse. Two yards appeared to have experienced substantial mite drift. We’ve already collected enough data on efficacy, lack of adverse effects, and lack of honey contamination to submit to the EPA, so all that I’m now trying to figure out is the optimal formulation and application method. I read a great number of scientific papers. I often get the impression that the researchers so want to get their paper accepted for publication, or to make their results appear important, or to support some product, that they’re unable to hide their bias. Since my research is funded solely by beekeeper donations, and since I’ve got nothing to sell, I’m going to go over these results with a very critical eye. My only vested interest is that I want a midsummer treatment that I can use in my own operation. Honey bee field data is often messy, and a number of factors can affect mite buildup in a hive. What I’d like to show you is some of the ways that I looked at the data, in order to see what I could learn from this trial. Both last year’s trial and my springtime trial indicated that OA/gly treatment may not cause mite wash counts to drop appreciably until after 3 weeks duration, so I didn’t want to waste time performing midpoint mite washes on all 225 test hives. Instead, in order to confirm that the same thing was occurring in this trial, at Day 21 after applying the towel treatments, we went to our largest yard (containing 60 test hives), and took mite washes from three normal-looking strong colonies from each treatment group (I skipped over weak hives, since they would have had greater OA exposure per bee; there were no M’s in this yard). The results are perhaps best displayed by simply dividing the midpoint mite count for each hive by its starting count, which gives the fold change relative to baseline (e.g., 1.5 means that the average mite count went up by 50%; 0.5 means that the ending count was half the starting count) (Fig. 7). Figure 7. 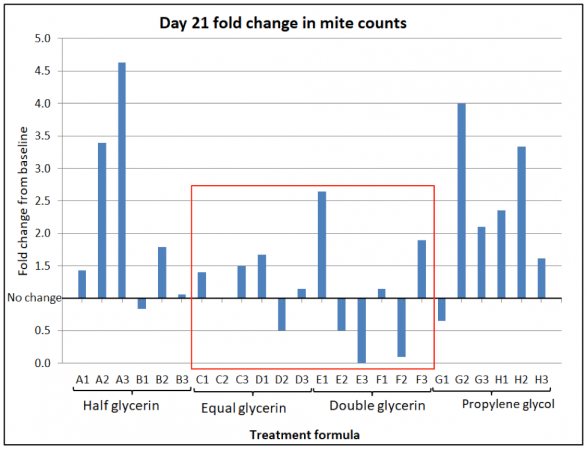 Fold change in mite wash counts, per each hive, at Day 21 after application of treatments. 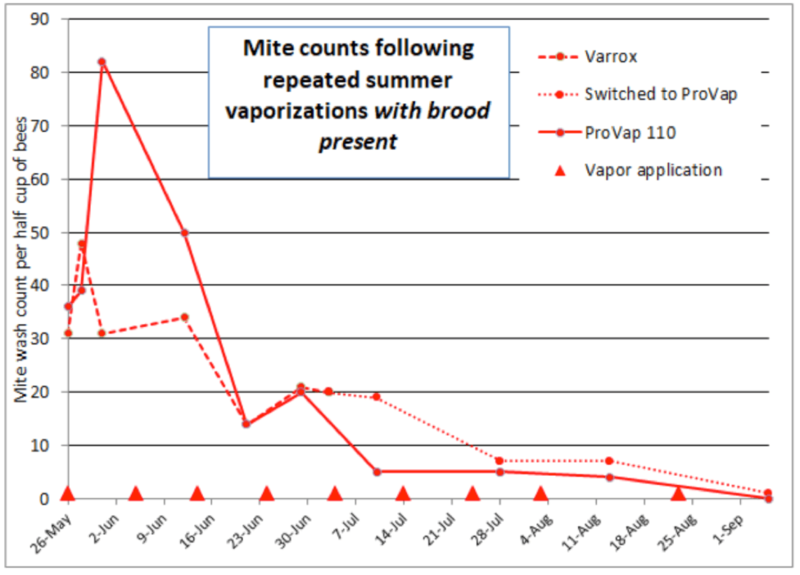 Columns below the “no change” value of 1 indicate a reduction in the mite wash count (missing columns indicate no change). 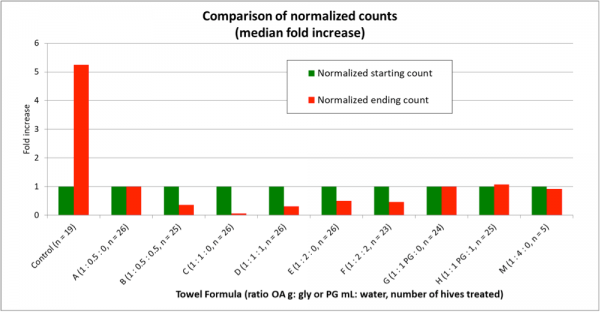 Note that the equal glycerin treatments had in only one hive reduced the mite counts by this time, although half had gone down in the double glycerin treatments. Note how this correlation flips by Day 50 in the next graph. At this point in time, neither the half-glycerin nor the propylene glycol treatments were impressive. We waited to take endpoint mite washes until about 50 days (range 47 -56 days) after applying the towels. I took field notes on ending colony strength, disease, productivity, and number of hive bodies, in order to see whether there were consistent issues with any of the treatments. Nothing stood out. I also wanted to make sure that the data wasn’t skewed by the results of a single yard. Since most of the 14 test yards had roughly the same distribution of treatment groups, I checked to see whether the results in any single yard stood out–none did (not shown). However, in nearly every yard the C and D treatments (1:1 OA:gly) most consistently prevented mite counts from increasing. In all but 1 of the 19 Control hives (remember, we considered most of the Controls as potential mite-resistant breeders), mite counts increased–on average, fivefold. So two ways to look at the data would be (1) to see the average fold increase or decrease in mite count in each treatment group, and (2) to calculate the percentage of hives in each group in which mite counts went up (these could be considered as inadequate mite control). I’ve displayed the results in Table 3. Table 3. 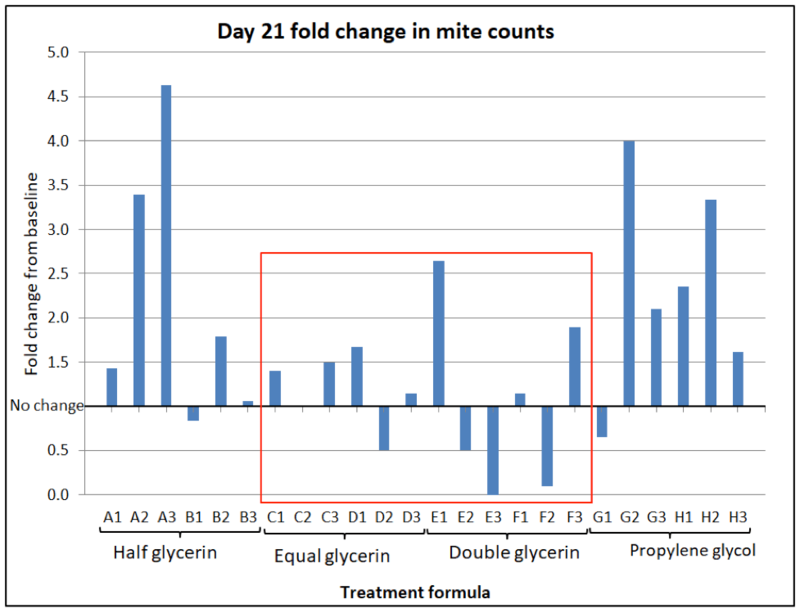 The third column shows to what degree mite counts went up or down in each test group over the 50-day treatment period–a value less than 1 indicates that the average count went down. The last column shows the percentage of hives in the group in which the count went up. Note that most of the formulations resulted in some degree of mite reduction — but that some sure did a better job, and that’s exactly what I was interested in finding out. The yellow-highlighted 1:1 OA:gly treatments were the standouts. Practical application: even the best OA/gly treatments did not prevent mite counts from increasing to some extent in about a tenth of the hives. So what should we make of those “outliers”? A big problem with data analysis of mite treatments is the “outlier” values. No matter how effective the mite treatment, you’re likely to find some colonies in which the mites were not controlled. 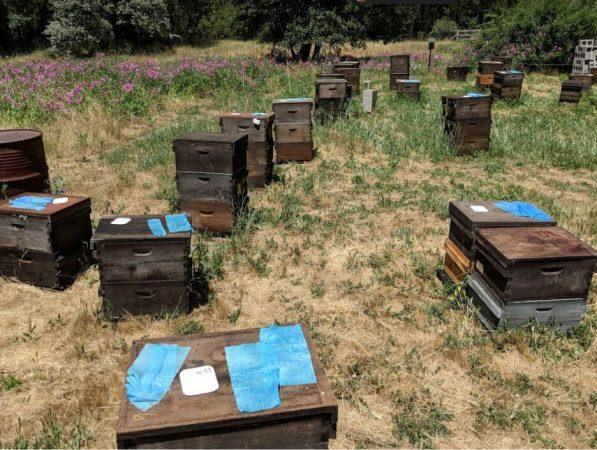 In this trial, the yards were surrounded by woods and residences with recreational beekeepers, so it’s likely that some of the test hives picked up extra mites from robbing or drift. As an example, let’s take a look at the pooled data for the C test group (Table 4). Table 4. Mite counts for the 26 hives in the C treatment group. For that reason, with mite count data, I prefer to look at the median value, since it is more resistant to the influence of outliers . The median represents the midpoint value of the data set. You can compare the differences of the two sorts of averages at the bottom of the table. It’s far easier for the human brain to detect patterns in graphical form than by just looking at a bunch of numbers. This is why we use charts — to put numerical data into a more visually-understandable form. Below (Fig. 8), I’ve graphed the fold increases by simply “normalizing” the data (by dividing each group’s starting and ending counts by its starting count), which then makes all groups start at a value of 1, and easier to compare. Figure 8. By normalizing the data to all start at a value of 1, it’s then easy to compare the changes in mite infestation rate for each treatment group over the course of the trial. Note the huge difference between the Control and C groups — we’ll return to that later. Any treatment that prevents varroa levels from increasing would be good, but what most of us are interested in are treatments that actually reduce the mite count. So next I calculated the percentage of hives in each treatment group that reduced the mite count to less than a quarter of the starting level (Fig. 9). Figure 9. 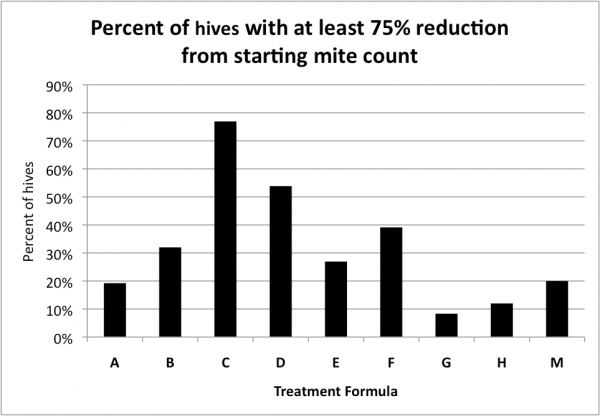 The percentage distribution of hives exhibiting at least a 75% reduction in mite count. The chart indicates that in 77% of the C hives, and 54% of the D hives, the mite count was reduced by at least three quarters (it may take a minute to get your head around this chart). But simple reduction of counts at the time of year that the trial was run doesn’t tell the whole story as far as efficacy of treatment compared to the Control group, since alcohol wash mite counts would have been expected to greatly increase at this time of year, not only because the mites had had nearly two months to build up, but the colonies had also gone from early honey flow buildup into dearth, with a resulting shift of mites from the broodnest to the adult bees, not to mention the immigration of mites from collapsing high-mite hives in the neighborhood. I’ve illustrated this with a snip from a simulation by my mite model for the Control hives in this trial (Fig. 10). Figure 10. A simulation  for the mite buildup in the Control colonies. I’ve circled the predicted counts; the actual median field counts for the 19 Control hives were 4 and 21 — hard data which helps to validate the model. So the reduction of mite increase by each treatment must take into consideration that the mite counts, without treatment, would have been expected to increase fivefold (refer back to Fig. 8). This is taken into consideration by the various methods for calculating the efficacy of a treatment. I prefer using the Henderson-Tilton formula , using median values in order to minimize the effect of outliers. I’ve graphed the results below (Fig. 11) with the median values for the starting and ending mite wash counts shown as columns, and the calculated efficacies of treatment in boxes above the columns. Figure 11. This chart shows the actual median starting and ending mite wash counts for each group, with the calculated overall efficacy of treatment above each red column. Error bars indicate the median absolute deviations. Compared to the huge increase in mite counts in the Control group, all the treatments exhibited good efficacy. The standouts were the C and D 1:1 ratio formulations, with up to 99% calculated efficacy. The above chart is the sort of overall representation of the data that a scientist would want to see, since it includes error bars, which indicate how well the calculated median values actually represent the raw data with those danged outlier values. What one looks for is whether the error bars for any pair of columns overlap each other. It appears that I got close to choosing the best ratio to test last year, since in this summer’s trial, formula C was the clear winner, at 99% efficacy, and no overlap of error bars. It was immediately apparent as we took final samples that the C- and D-treated colonies generally looked the best, as far as health and honey production, although there were good and poor colonies in each treatment group. However, the C formula creates a soggy towel that is difficult to apply — a formula halfway between C and D might be optimal, and would require one full shop towel per hive. The low-glycerin A and B treatments didn’t fare well, nor did G and H, which used propylene glycol, which is also food grade, but with much less viscosity and surface tension than glycerin — but there didn’t’ appear to be a benefit. Surprisingly, the low oxalic/ high glycerin M treatment managed to attain 82% efficacy, despite only containing only 9 grams of acid. The original 2:1 Argentinian formula did pretty well at about 90% efficacy. Based upon this single trial, I’d hesitate to declare a clear winner, but there are other considerations. Of interest is the performance of the Argentinian ratio of 1 g OA to 2 mL glycerin. In my springtime trial (in prep) this formulation stood out since it resulted in what appeared to be (I’ve yet to confirm by titration) an immediate transfer of OA onto the bees, causing agitation and increased mite drop over the first few days, with formula C being next behind. 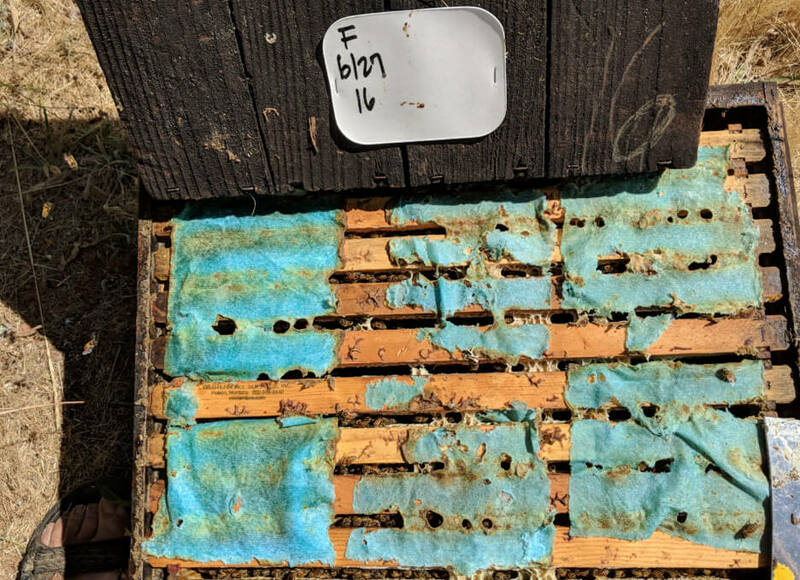 This confirmed what I observed in my cage trials (and in last season’s field trials) — that towels dripping with glycerin rapidly dispersed the acid onto the bees and mites (which may account for the Day 21 performance of the E and F groups). But that rapid dispersion can result in adult bee agitation and brood kill in the first week. I have not investigated this with the hanging strip application method, and am not critical of it. However, based upon the results of this trial, when applied via shop towel across the top bars, it appeared that the lower glycerin ratio gave better overall performance. I’ve now run four separate controlled field trials on OA/gly towels, under California conditions, in different yards, in two different years. In all four, I obtained at least 90% efficacy after 42-50 days, using formulations in the 1:1 range. I’m pretty excited about getting this application method approved. Surprisingly, we get this efficacy at about 1/5th the dose of oxalic acid necessary with the Argentinian strips — 18 g per hive vs. 80 g. That 18 g is equivalent to about 9 OA dribbles or vaporizations, although some of the OA remains in the towel residues. I was curious as to how the effect upon varroa from extended-release application of 18 g of oxalic acid in glycerin would compare to repeated oxalic acid applied by vaporization. In my springtime trial I had tested two models of vaporizers on one colony each, so I extended those repeated vaporizations through the summer trial. In all, I applied to those two hives a total of 9 treatments of 2 g of oxalic acid each (resulting in the same total of 18 g), at roughly 10-day intervals over a period of 102 days. I’ve plotted their mite wash counts below (Fig. 12). Figure 12. The results of repeated vaporizations of hives with brood. I switched the Varrox hive to using the ProVap 110 in July (to save me the trouble of using two different electrical sources). I plan to run a more formal trial next year to compare repeated vaporizations to dribbles. Thanks to Larry at OxaVap.com for the donation of the vaporizers. It’s surprising to me how well the bee colonies handle regular exposure to oxalic acid. In my towel-treated hives, the brood looks great at 50 days. Ditto for those hives that received 9 vaporizations (Fig. 13). Figure 13. This photo illustrates the high rate of brood survival in the ProVap 110 colony 10 days after its 9th vapor treatment. My informal observations indicate that colonies can handle repeated or continual exposure to oxalic acid quite well. I’d hesitate to treat colonies continually all year, but oxalic certainly has its place in our arsenal of mite control tools. The bottom line is that the above data indicate that a single application of an OA/gly towel may give as good results as multiple vaporizations, but without the need to wear a respirator and eye protection. Vaporizers have the advantage of being able to apply the treatment without cracking the hive, not leaving any remnants to remove, and some, such as the ProVap 110 are pretty quick. But those with any sort of pressure chamber should be used with caution (Fig. 14). Figure 14. My friend Bill Hesbach in Connecticut was using a vaporizer, and inadvertently pressed the vapor exhaust tube against an end bar. The vaporizer blew its lid — splattering his face shield with molten oxalic acid. Bill could easily have lost his vision. Be careful when using vaporizers! That’s a lot to love! But there are also some shortcomings and things to still work out (besides getting it registered by the EPA). One problem with OA/gly towels is that some colonies remove every bit of the applied towels (Fig. 15), whereas others barely touch them (Fig. 16) — meaning that you need to scrape out the acidic residues with a hive tool (they are corrosive, but readily decompose on the ground). The towels also make inspection of the lower brood chamber more difficult, but most of us don’t inspect that chamber during the honey flow anyway. Figure 15. Some colonies completely removed every trace of the towels by Day 50. I only wish that this were true for all hives. Figure 16. Alas, some colonies apparently have little interest in house cleaning, and barely remove any of the towel treatment. These residues scrape off easily, but are still acidic, so your hive tool needs to be rinsed afterwards. The other shortcoming is that it takes at least 6 weeks to realize the full effect of the treatment. This is a treatment best used proactively, rather than after mite counts have already climbed to high. Don’t expect this treatment to quickly take care of high varroa infestations late in the season. My feeling is that if we manage to get this application method approved for putting into our hives just before we add honey supers, it could be a godsend to us in our battle against varroa. Let me be clear–I’m not stuck on the shop towels. Using vertical cardboard strips was simply too labor intensive for a large-scale beekeeper, but could be fine for a hobbyist. Another beekeeper outside the U.S. reported to me that they get better absorption with another brand of paper towels. I’m wide open to experimenting with other towel types or completely different matrices to hold the OA/gly solution. As of now, it appears that the most promising formulation might be 1:1:0.5 (OA g: glycerin mL: water mL). This formulation would be a compromise between the efficacy of the C treatment and the handling characteristics of the D treatment, and would require 1 fully-saturated shop towel per hive. I have not yet tested this formulation. For those of you in New Zealand who can legally make your own OA/gly towels, the formula that I plan to test next season is something between the 1:1 and 1:0.5 g OA: mL gly. The problem is, it requires 1½ Scott Shop towels to hold the 18-g dose of OA in a 1:1 solution, unless you make the towels dripping wet with glycerin. The other problem is that if you make up the towels with the towels still on the roll, they don’t absorb as much solution as they do if simply stacked up. But it’s handier in the field to simply unroll towels off a half roll one at a time. I’d like to come up with an application method that requires only two towels (or other cellulose carrier) laid crossways across the top bars with a space between them for bee traffic. The main site of exposure is likely the top of the towel (perhaps the cellulose matrix could be placed on wax-coated thin cardboard for easier later removal. I’m wide open to suggestions for application methods that don’t require the insertion and removal of multiple strips (too much labor for the commercial beekeeper). The above recipe still makes a fairly sticky and oily-feeling towel, but they pull off the roll nicely once they’ve cooled. They’d likely be better if made with a more-absorbent towel type. Update 1 Dec: After allowing the roll of towels to sit uncovered for a full day in a cool room, the texture changed completely! They are no longer sticky or oily feeling, and peel off nicely, leaving no noticeable residue on my fingers (wear gloves). This formulation may be a winner! To make a roll of 55 towels, cut a roll of Scott towels in half crosswise. Fold the edge of the first towel under, since it is very hard to find later if you don’t. Put on safety glasses to protect your eyes from any splash. If you get any acid or solution on your hands, simply rinse off with warm water (there’s no rush–the acid works very slowly on your skin). Place 505 g OA dihydrate crystals into a saucepan. Turn on the heat, and stir until the OA is nearly completely dissolved. At this point, the temperature should have risen to about 140°F (60°C). Turn the heat down to medium and continue to stir until completely dissolved. 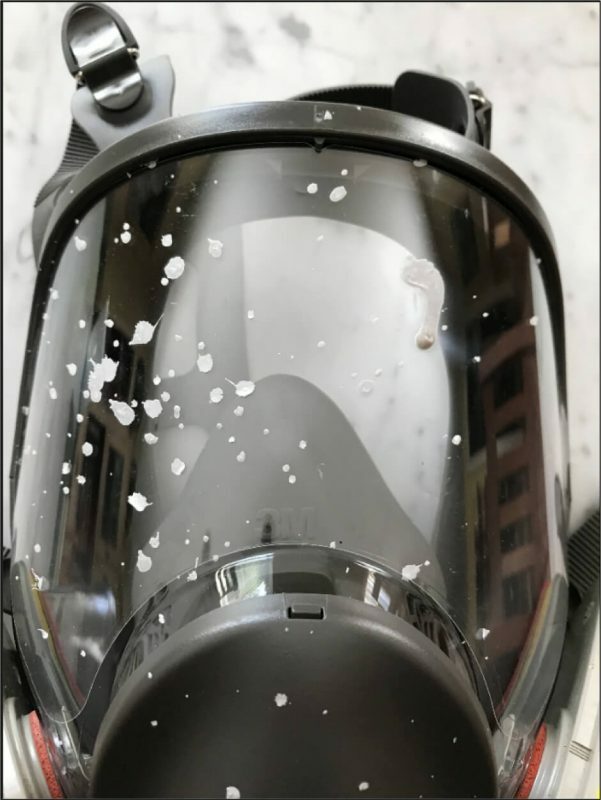 There’s no need to allow the temperature to get above 160°F (70°C), but you can allow it to climb to 170°F (76°C)–above that temperature a chemical reaction will take place and bubbles will form–avoid this. Warm the half roll of towels for 30 sec in the microwave (longer can cause fire). 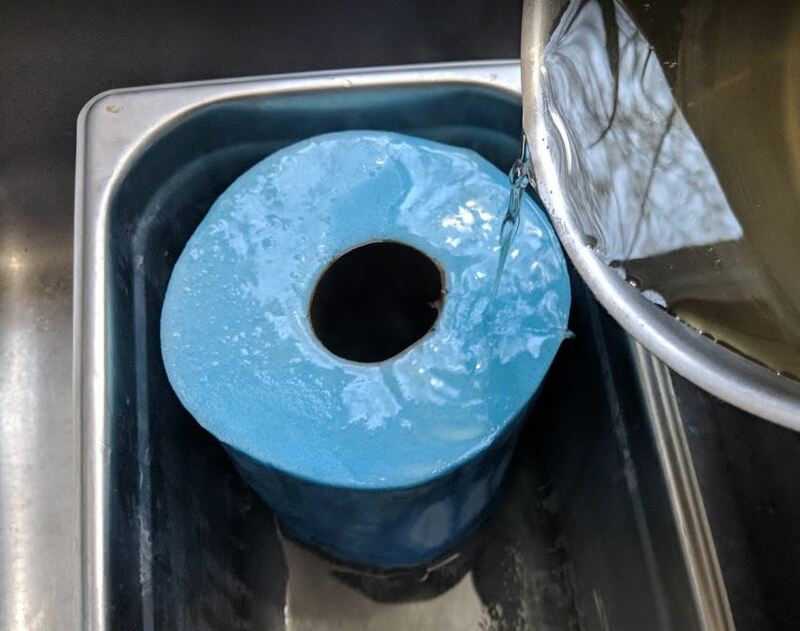 Place the roll upright in a pot, and slowly pour the hot solution round and round over the top of the roll, only as fast as the solution is absorbed into the end of the roll. It took me 4:40 minutes to make the pour. Any solution that spills over the side will wick up through the bottom of the roll. After all solution is absorbed, you may wish to flip the roll end for end as it cools, for even saturation. Allow the roll to cool before attempting to peel off any towels. Makes 55 half towels—enough to treat 27 hives. Apply 2 half towels per hive, crosswise between the brood chambers—applies 18 g OA per hive. Apply at placement of honey supers. 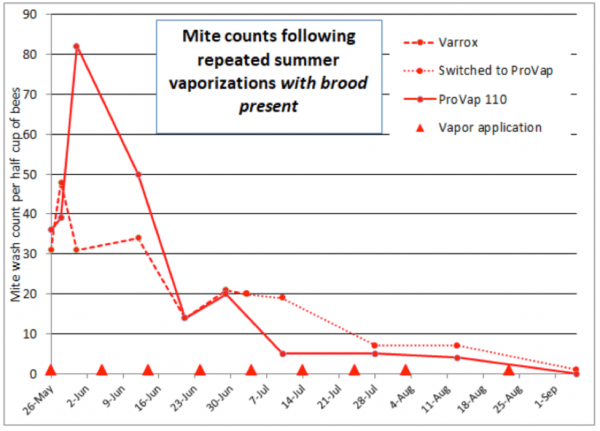 Do not expect to see appreciable mite reduction until 6-7 weeks. This application method is not yet approved for use in the United States—I in no way promote any off-label application of any pesticide. Thanks to Maggi group for their initial work on this application method, to all the beekeepers who have donated to my research, to my sons and crew, my assistant Brooke Molina (who handles getting things done on the right dates, plus the mountain of data sheets), and my ever supportive wife Stephanie. Maggi, M, et al (2015) A new formulation of oxalic acid for Varroa destructor control applied in Apis mellifera colonies in the presence of brood. Apidologie 47(4): 596–605. In order to minimize the effect of outliers, we can use robust statistics, in which for “average” values we calculate the median instead of the arithmetical mean, and use the median absolute difference instead of the standard error of the mean.